I’ve been thinking a lot about income reports and whether or not to continue with them. I’d love to have feedback from you. I can see really strong reasons why I should stop and why I should keep going. I’ve always been a champion for income reports and never really considered stopping, but as the blog and business changed, I had to consider this. The easiest way to do this is to explain both positions to you. I made a promise to myself that I would post my income reports every month so that other women could see that blogging is a viable career choice. That promise means a lot to me and isn't something I take lightly. It actually helps me grow, writing these monthly helps me reflect on what went wrong and what went right every month and gives me an opportunity to see where I can improve. It serves other bloggers- being able to see what's possible and basically follow along my entire journey from the beginning saves you from making the same mistakes that I did. It’s kind of like having an edge, I follow other bloggers above me and get that same benefit, so it seems wrong to not pay it forward. I wonder if I’m really helping you at the level I’m at now. I see a trend where I post what I’m working on, like SEO, and then I get tons of emails from brand new boggers also working on SEO. Which actually doesn't help them much. They’d grow quicker if they focused on Pinterest first. But since I focused on Pinterest a while ago and am no longer talking about it, they’re not seeing me talk about that. I guess what I mean is that I feel like there’s a disconnect between what you read that I’m doing and what a smaller blogger should do. This isn't a huge deal because there are tons of larger bloggers that read and benefit from income reports, but statistically, it’s going to be more new bloggers and I worry that I’m doing them a disservice. I should have included expenses by now, but don't really want to alter my schedule to make that happen. As soon as Facebook ads come into play, expenses matter a lot. Prior to Facebook ads, and full-time employees, our overhead was ridiculously low. And even the expenses we had were really mostly to make my life easier, not a necessity. But higher income means higher expenses. Like in the income report below… I made $86,000, but had over $20,000 in expenses mostly from FB ads, Is $66,000 profit still amazing? Of course, but I worry that it might look misleading. An easy solution would be just to add expenses. But in order to do that, I would have to completely change the way I do things. Currently, I have a budget I follow and as long as my ads are profitable, we scale them up. I don't actually know my expenses until about a month behind, we’re usually right on budget and have tons of leeway if we’re not, but this seems like a pain for me. Income reports actually take a lot of time for me to write up, adding expenses makes that longer. We did post our expenses in a prior income report, but it didn’t seem to have any added benefit, which means the extra time doesn’t really have a pay-off. While this information likely benefits a select few people, it wouldn't really help most people. Plus, it may frighten off brand new bloggers who think they would need to spend $20,000 a month to blog, not understanding that new blog only needs about $3.95/month to run. So, after talking your ear off… what do you think? Keep income reports or ditch them? Change them? Why? If you’re wondering why I post an income report, it’s because this journey was only made possible by other bloggers posting their blog income reports and inspiring me to give it a shot on my own. This is kind of my way of “paying it forward”. Plus, I love the fact that I work in the only industry where it’s totally normal to post your income every month. If you are a blogger or end up being a blogger, I would love to see you post your income report too! You can actually link to them in the comments below. I knew nothing about blogging. I didn’t understand how I would make money. I didn’t know what a niche was, or a target audience. And my computer skills would embarrass an eighth grader. I didn’t even know how much money “full-time blogging” meant. I was hoping for $2,000/month. 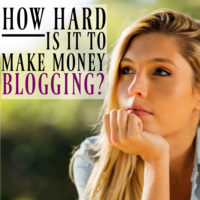 I talked to my husband that night and we took money out of our extremely tight budget to enroll in Elite Blog Academy. I worked my tail off, took the class extremely slowly (it took me 9 months to complete the class) and implemented every single action step. In 10 months, I was making my “full-time” income of over $2,000. In 15 months, I was making more than I’ve ever made in my career. 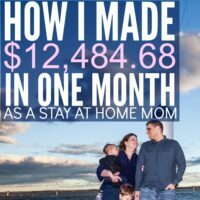 18 months later, I was making over $20,000 a month blogging. And this month I made $86,000. 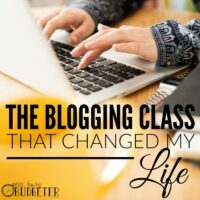 Elite Blog Academy literally changed my life. (Heads up: The ONE downside of Elite Blog Academy, is that it only opens for registration once per year for five days, so unless you have almost perfect timing, the only way to get an offer to enroll is by joining the waiting list here). This was a solid month for income and was pretty stress-free and easy. Income went up, pageviews went up, I’m back to batch blogging and working ahead of schedule. P.S. It’s 5 pages long. It’s not a course and it’s not overwhelming. It’s a super simple detailed checklist of how to dominate Pinterest in only 4 hours of setup and 4 hours a month. P.S. This is about 15 pages long, and includes a complete launch example. Like the Pinterest Strategy Guide, it’s not created to be comprehensive or overwhelming. You should be able to complete it in a workday and start being successful with affiliates immediately. Continue Facebook ads- Rocked it! It was a hard month, and Facebook ads are still not my native language, but we’re seeing gains. I took Absolute FB ads, then EBA VIP training, and then a ridiculous amount of a/b testing and time. I wish there was a simple solution, but there’s not. It takes a massive amount of time and you need to stick with it. I’ve been on and off messing with facebook ads for over 6 months now and FINALLY made significant strides. Book keeping system – On track! This will take a few more weeks but it is almost completed. We created a system that lets full-time employees track their hours worked by project, and all expenses and income get tracked by project. So basically, we can now at a glance tell where our time and money are best spent, helping us make better decisions going forward. It also allows us to track income earned and received each month and bases each monthly budget off last month's income allowing us to reinvest a portion of our extra profits from the month before in the projects that give us the highest return. Not gonna lie… this budget blogger is totally geeking out over this system. Facebook ads- We were able to make them both profitable and scalable. I’m anxious to see what happens during the rest of the year as the “budgeting craze” of January wears off. 12 Week Year- This system is amazing. I’m about 1/3y through my first 12 week year and I’m probably more productive than I’ve ever been. It has me focusing on just 1-3 goals for the entire 12 weeks which is a huge jump from what I’ve always done but is working. I highly recommend it! (If you’re a brand new blogger, I suspect you’ll see more success with the 10 hour time block strategy, but once you have a team and help for your blog… the 12 week year is the way to go. Every plan I had for the month – We had a ton of stress from the brewery opening (tell me again why we did this? ), my dad (who's an instrumental part of my life) was diagnosed with lung cancer, and I wound up in the hospital with Afib for three days (it was my first episode so I had no idea I had Afib). Facebook groups – Having so much personal stress meant that instead of getting work done, I was spending time scrolling anxiously. I have a saying… If you're flipping between facebook and email waiting for something exciting to happen…. You have a problem. You could have made something exciting happen if you had just gotten off your phone and got to work. *That being said- I failed miserably at this all month. Bookkeeping system: Finishing this system is my only goal for the month. Need help finding affiliate programs that will work for your blog? I have a master list here of the best preforming affiliate programs in every niche that you can get for free here. I totally hear you about income reports. I’ve been on the fence, too, and your reasons for stopping are very valid. One idea would be to post quarterly updates. This takes the pressure off of doing them monthly but still allows us to see your progress! Congratulations on such a great month!!! Do you do all your FB ads yourself or do you have an expert helping out? I’ve been dabbling since January and have had an increase in sales, but I honestly can’t tell if they came from the ad or just from my site. Lots of work to do!!! Please don’t stop posting them. As a new blogger, it is one of the main reasons I visit your site on a regular basis. I do understand that you are not a newbie anymore but please don’t underestimate the value you add for newbies too. You inspired me to take this journey when I was on the fence and you also inspired me to take Elite Blog Academy. Your transparency is what makes you different! Your ability to communicate concise and simple instructions makes you unique! Overall I hope you choose to keep them (even without expense reports) and I congratulate you on your success. You are an excellent example of what happens when you want it bad enough to make great things happen! Thanks for sharing all that you’ve shared! I believe you should stop posting income reports. At this point, there are enough for newbies and anyone else to review and gain inspiration. I believe you should have more privacy at this point when it comes to your income. You’ve been open and transparent. I believe you’ve done your part. Kudos and all the best on the new brewery business! Most of all prayers for your Father. You are absolutely crushing it! Awesome job. Since you are making so much with your own products + affiliate sales … I would GET RID OF AdThrive altogether. Yes, easy for me to say, it’s not my $5,000 that would be going away. However, in the grand scheme of things, it’s only 6% of your revenues. The benefits would be huge. First, it would speed up your site immensely. Your site is very slow with all of these ads. It’s probably killing your SEO rankings. Second, it would declutter your site design – there are like 10 ads on each page and they take up a LOT of page real estate. So, it would be a MUCH better user experience. Then, where some of those ads used to be, I would put opt-ins to capture emails. You’re barely capturing emails on your site! You could double your conversions instantly. And in the long run, those email subscribers are worth MUCH more than ad revenue. I completely agree… I’ve been thinking about that for a while… and now I have to ask, what’s your blog? I love your reports and hope you’ll keep posting them. You make GREAT points about stopping though so I understand where you’re coming from. I love to read about what’s working. And the fact that you state your income is motivation for me to continue blogging and trying to reach greater goals. I also love that you say how much your spending in FB ads. Although I’m not at the point to spend that much, it’s helping me realize what percentage I should be spending to get the right return. Thanks for all you put out there for us to learn from! Keep up the good work! You are truly an inspiration! I just want to say thank you from the bottom of my heart for sharing your income reports. While I totally support whatever decision you make, they have made a difference for me. I came to the online business world in 2010. I had started my own therapy practice the year before, and I had this idea in mind that didn’t even have words to describe it then. I wanted to offer tips, videos, classes, books, and more online in order to help more women. People looked at me like I had three heads. No one understood what I was talking about. I found some coaches who taught me about online businesses. I learned a lot. In fact, it’s making it much easier now to see that a blog isn’t your business and how the entire big picture fits together. But they were teaching people how to do coaching. I didn’t want to do that. I’m already a therapist. I wanted to leverage my abilities to help more people, not do more one-on-one work. I have spent way too money for the ROI since 2010. Every time I would get motivated and dedicated, my therapy clients would have a crisis, and I wasn’t able to be consistent with my blogging efforts. In 2015, it finally hit me that the online business model I was trying to incorporate was a blogging model, not a coaching model. But then I saw all kinds of posts everywhere asking if blogging was dead. I got scared again. I really want this vision I have to work. That’s when I went to Focused the first year. The second year I met you, and I was blown away. You had far surpassed what I even thought was possible. I was a little curious, and nervous, at first. But since then, I have followed you and your reports. It’s given me courage. It’s given me hope. It’s reignited my fire. I know women are looking for what I want to offer them. No one else is doing this the way I have in my head. And I know it can work because I’ve read (OK, stalked) your income reports to see what was working and how you did things. I signed up for EBA this year because of the many testimonials from you and the others in your class who not only DID it then, but who are still rocking it now. You are making your business thrive from your niche, not from teaching people about blogging or online business. Those pieces were crucial for me after years of learning with so little return (I have made about $18/yr on my blog each year- what is it about that number?). So thank you, thank you for sharing these reports. Thank you for caring about what it means to those who read them and how they may interpret them. Thank you for being passionate about wanting to make sure other women know they have choices. Thank you for your transparency and helpfulness. Thank you for your willingness to just share tips and to root for the success of strangers. Because of you and these reports, I am determined to have a very different story to share at the end of this year. I am following your cheat sheets to a T.
If you do decide not to share your monthly income reports (and no worries about not sharing the expenses in detail- what you have shared in the past has been sufficient for me), I would love if you could still find a way to share your message with your readers and the women you want to inspire that it IS still possible. That blogging isn’t dead. That there are achievements beyond their wildest dreams that are attainable. That your income hasn’t shrivelled up and disappeared after one or two magical years. What that format looks like may be different than it is now. But I can see how someone with a story similar to mine would welcome some message, even abbreviated or vastly different than your monthly income reports, to help encourage her to go forward. Thank you again for sharing these throughout the months. I have already been blown away by EBA and the bonuses you offered. Thank you for finding a way to share this, even after being sick and being with your father. My thoughts are with your family. Please keep posting your income reports! I read them with interest even though I’m way earlier on in the blogging journey than you are. It’s inspiring to read and I do learn quite a bit about what it may be like later on! Maybe you could link to earlier reports that are more relevant to newer bloggers, to point them in the right direction? Also, adding expenses is really helpful for me. I actually hate that most bloggers don’t include them, because it is misleading. I have no idea what percentage of the income people are spending on expenses. 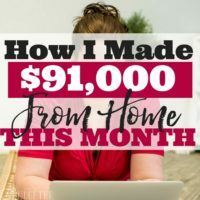 It’s really eye-opening to see and I feel like it gives people a much better idea of what it’s like to blog and what the expenses are like later on when you make more and start getting more strategic. Keep the reports! Your income reports are part of what inspire me; I think, she did it, I can too! Despite being a relative newbie and having lots of work to do to get my blog to the level I want it to, when I read your reports, I get inspired to work that much harder. Please keep them; they’re excellent motivation, and I love seeing how you grow. Even if I’m not at your level, I’m learning a lot! I pray you keep the reports. Pat Flynn still publishes his, as does the man who does Entrepreneur on Fire. Personally, I find them inspiring so we know what to push for. I believe the “sky” is the limit, but if people stop publishing their reports, we will have NO clue what the sky actually is. People with money acceptance issues are sincerely helped by people like yo who are transparent and open. All of this written, I respect your personal choice in the end. These are amazing results, Rosemarie. It’s nice to see how you are continually growing. I hope to one day have some real products, but they will take some time to develop. (currently, I have 2 ebooks), but I am going to try a a B2B item in the future (first a more expensive ebook and then maybe a course). I hope that you will continue with your income reports as they are helpful. (And, I bet they help contribute to your email list and affiliate/course earnings). Maybe there’s a way to streamline and/or have a section for your top recommendation for the month for new bloggers (or growing bloggers) and/or feature a newbie and link to them/provide your advice for them. Just a thought. It’s not on my main site (as it wouldn’t really go on there – TheFlooringGirl.com (completely out of place…I think…but let me know, maybe there is a solution…I’m all ears). My blog has been around a while, but I’m still new to affiliate marketing/monetizing. I made my first substantial chunk Dec 2016. Onward and Upward! Please keep the reports coming. Maybe you can add related posts or a call out box for those new bloggers like “START HERE” and point them where to go. 😉 I do think expenses are important for perspective. Maybe you can estimate them or you publish the monthly report a little late after you have the tallies. I’m sorry to hear about your dad and the life drama. Your comment about Facebook and email is so true. I fall into that trap as well. Or sometimes I realize I’m zoned out on the computer and that’s when I need a little break. I like the suggestion of just posting your income reports quarterly. I find them very informative and encouraging and would hate to see you completely get rid of them. It sounds like you’ve had quite the eventful month. I hope some how, some way, you are able to have a much calmer month! I always enjoy blogger’s income reports and feel the addition of expenses gives the full picture. You know, Rosemarie, like many others, you have profoundly affected my life and I am sooo appreciative. And there are always going to be people who will not listen to those who are experienced. They think they can see more clearly than those who have been there before. How many people have I seen pay hundreds of dollars for a course so they could have step-by-step instructions, who insist on adding things in before they study them! The income reports are fun to read, but obviously, this is your decision. Thank you for all the help you give! Okay I accidentally found you today and I couldn’t even tell you from where cause I have clicked way to many pages! You are refreshing.. I am a fence sitter.. I have been for a very long time. I really appreciate how simple you try to keep things when it comes to explaining the who what and why of blogging. Sometimes reading other blogs is just so overwhelming that I just end up moving on. I do appreciate your openness to sharing your income and understand your feeling that you might be speaking over some of us. But why not mix it up a bit? Go ahead and tell us where you are at (it is then a wanna get there goal for newbies), and a this is what I did (past goal/accomplished), and then a this is what I want to do next ! I’ll be following no matter what! 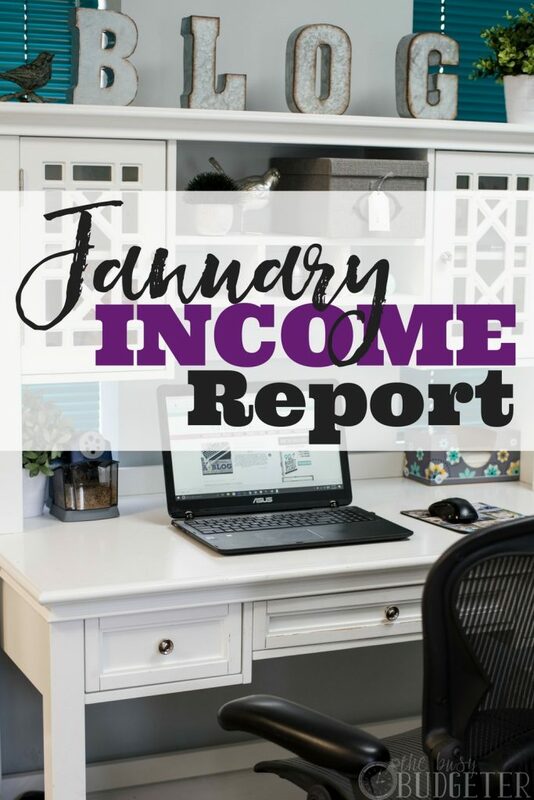 I added my very first Income report at the end of this post. Your income reports are so inspiring. This shows that there are so many possibilities on the Internet, we just have to find our own way to get them. Your blog is great, keep it going ?